As a kid I spent our 4th of July evenings walking with my mother and brother along Roosevelt Avenue in Queens to Shea Stadium to view the fireworks. My mother loved the 4th of July fireworks, which was strange because she hated crowds and loud noise. I never liked going to see the fireworks. It’s too loud and too crowded. And honestly, after a few minutes of oohing and aahing – I got bored and wanted to go home. But it was a tradition, a memory of my childhood. And when I became a mom, fireworks on the 4th of July was something I wanted my son Norrin to experience. However, Norrin’s early years of autism and his sensitivity to loud noises made the 4th of July stressful. It was a lesson learned the hard way. The summer Norrin was diagnosed we went to friend’s home for a backyard barbecue. As soon as the neighborhood kids started with the fireworks, Norrin started crying. The loud noises startled him and we had to leave. The 4th’s that followed, we tried to be home before dark. But as Norrin got older, and autism got “easier” we became braver and willing to try new things. Here’s what has worked for us, hope they work for you too. Plan Your Day Accordingly: If you head to the beach or park, arrive as early as possible. On days that we go to the beach or park, we like to get there between 9 – 10 am. That way by 2pm, we’ve had a day of fun and are ready to head home. If you’re planning on seeing fireworks, your child will need a break in the day. Get home early and let your child relax before heading back out. Bring Your Own Entertainment or BYOE: If you are going to someone’s home for a barbecue, make sure you BYOE for your child – whether it’s a favorite toy, book or electronic device. Make sure you have something that will entertainment and/or comfort your child if needed. Prepare Your Child: If your child has never seen or heard fireworks before – show them a few pictures or Youtube videos so they know what to expect. 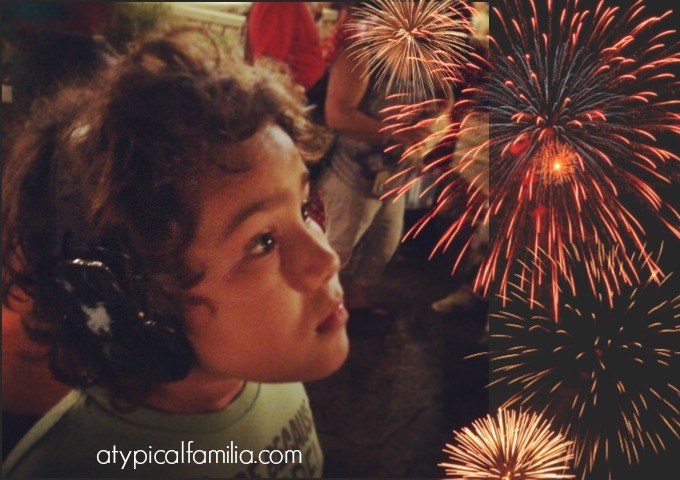 Make a Big Deal: Show your child that you are excited about the fireworks. Make a big deal – ooh and aah, point and squeal with delight! If your kids see you having fun, it may be fun for them too. Watch From a Distance: Drive someplace where you think you can have a good view of the fireworks – that way you can experience the 4th of July fun without the crowds and chaos. And When in Doubt…Watch from the comfort of your own home: Test the waters by watching the fireworks on television. Make some popcorn and snuggle on the sofa with your family.